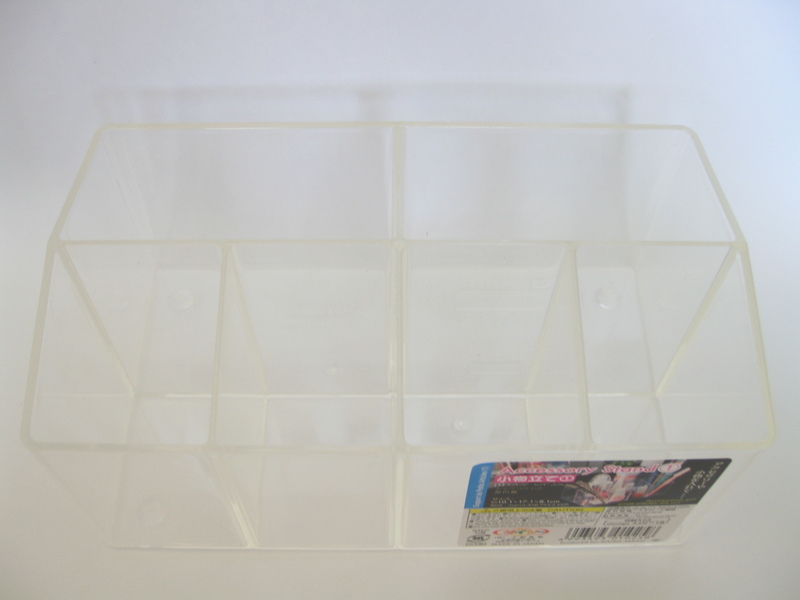 Recently on a trip to Daiso, I picked up this clear container with 6 compartments. 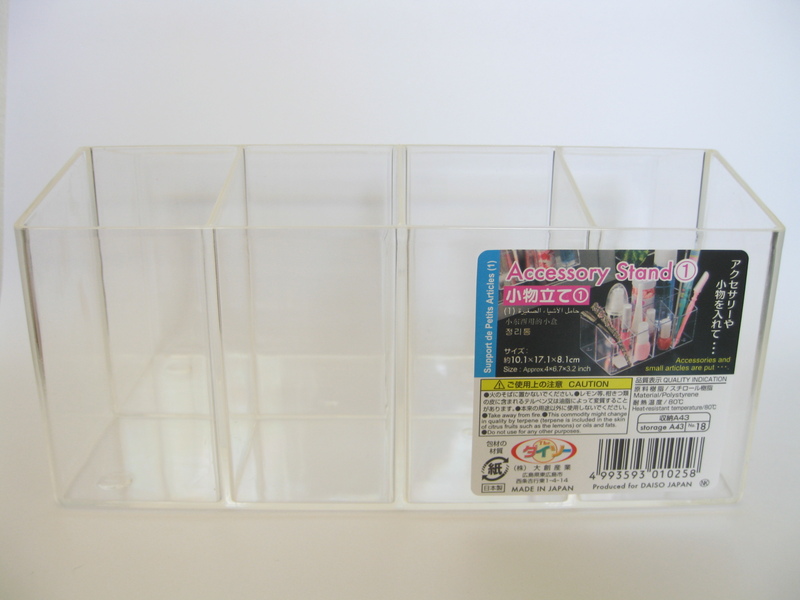 It also came in transparent blue, transparent pink, and I think transparent yellow. The container is the perfect addition to my makeup table setup. 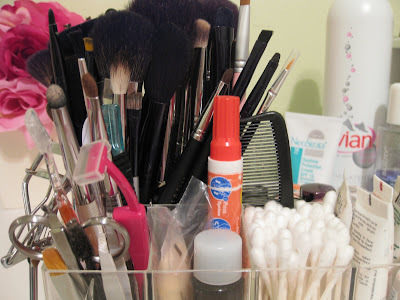 The container holds my most used makeup brushes, lipsticks that I'm currently using (a lot), brow and lash tools (tweezers, razors, spoolies, lash curler, etc. 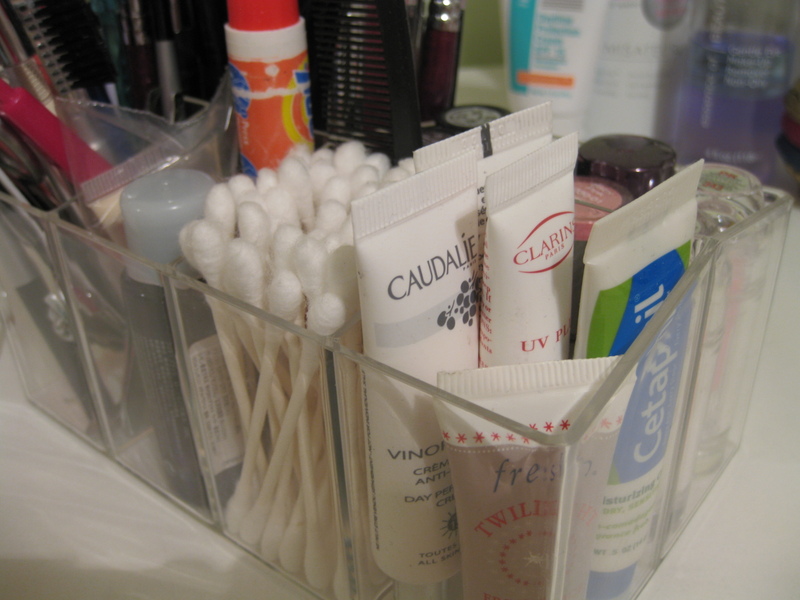 ), q-tips, and misc. deluxe and travel size bottles/tubes of creams, lotions, primers, and illuminators. 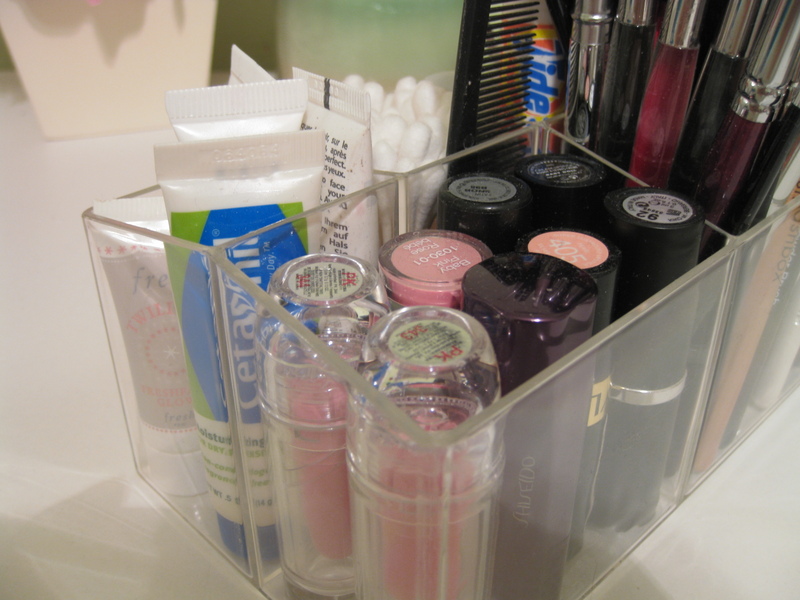 Overall, I'm really loving this new organizer. 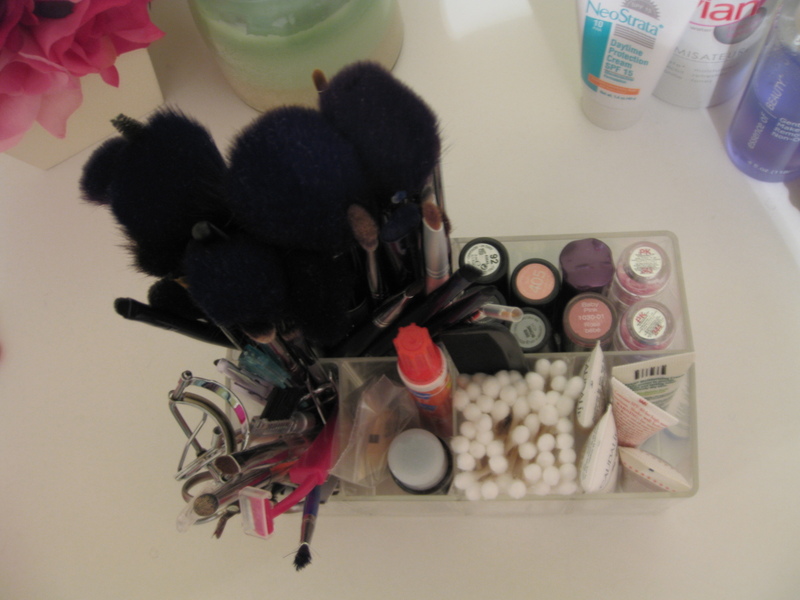 The only compartment that's a bit cramped is the one with the brow/lash tools but I can get over that. I do wish Daiso had another conatiner like this one with just 2 large compartments for "most used" lipsticks and glosses or eyeshadows and eye pencils -I wanted to put in more lipsticks but can only fit 8. For only $1.50, this is a great addition to my makeup table and makes everything look very nice and neat. Daiso is basically a Japanese "dollar store" that features a wide variety of products from cosmetics to kitchenware. It's a store of total randomness. At Daiso, I've found pretty false eyelashes, hair accessories, cardboard boxes (when I give cookies or cupcakes as gifts), cups and dishes, sewing materials, scrap booking supplies, dozens of colorful piggy banks, school supplies, and so much more. To view some of the products that Daiso offers and for store locations, click here. Daiso isn't actually a "$1.00" store -I've noticed that the prices vary depending on where you live. The majority of the products at my local Daiso stores are all $1.50 (unless otherwise marked.) Most of the gum and candy is $1.00. Other items can go for $2.00, $3.00, and $5.00 but I haven't seen anything priced higher. I read on Nouveau Cheap that the majority of the products at her Daiso store (in San Diego) are $1.89 each. Once you go to a Daiso store, there's no going back and I admit I'm a bit obsessed. I do find some nice things at the usual "Dollar Tree" and other American dollar stores but to me, the majority of the items look sort of cheap, don't work well, or the store is just so dirty that I get turned off. At Daiso, it's different. None of the things I've bought at Daiso have broken or worked so poorly that I've had to throw it out. Everything is very cute and "new" looking and the stores I've been to are very clean and bright. The only bad experience I've had at Daiso was when I bought a bag of chips. BEFORE buying any of the snacks, check the expiration dates. After I left the store, me and my friends ripped open the bag and started munching on the chips. They tasted very "off" so I checked the expiration date and to my surprise, they had been expired my 3 months! I took it back and demanded a refund -it wasn't the $1.00 I spend that I was mad about, I was mad that they were selling expired products. The cashier was fussy about it since there are no returns at Daiso. She also prompted to tell me that the expiration dates "don't mean anything" and Daiso puts "early" expiration dates on the bag to be cautious. To me, that's such BS. Expiration dates are there to tell you when it's not safe/healthy to eat the product. In the end, I did finally get my refund. My cousin also bought chips at another Daiso and found that they'd been expired too. So please, check the expiration dates. Great use of those empty drawers and for such a cheap deal too. I noticed that you have that Evian face spray thing. Do you like it?? :) Is it worth buying? Wow, the next time I'm visiting San Diego I am DEFINITELY popping in a Daiso. You Cali girls are so lucky to have such stores. I never go into Dollar Tree for the same reasons as you. Great tip on the expired snacks though...I've noticed that myself at the dollar store. 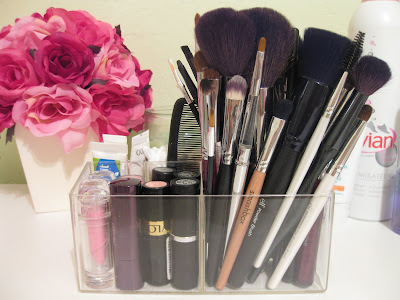 I got a clear makeup organizer from Target for $12. I thought it was a bit much, and this confirms it. $1.50...aggh! I severely overpaid! @ Nicoletta.. Hey girl, from what I've read online, Daiso has 2,500 stores in Japan and 522 stores overseas -but not yet in the UK. Hopefully they expand there too! I'm totally jealous of some of the stores and brands you have there though. @ Kristie.. Yupp, I feel even better about it because it was only $1.50! @ Rainy Days and Lattes.. I really hope you find it! If not, Daiso has so many other great/cute things, I'm sure you'll leave with something! And I feel bad you spent so much at Ulta! 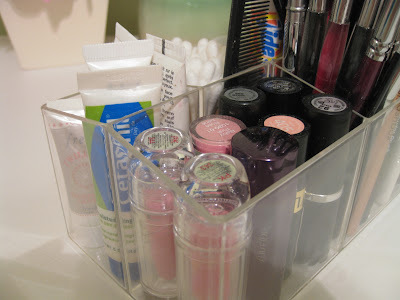 I also like Walmart for makeup organization supplies -Target has some nice drawers too but I prefer Walmart since the prices are lower. @ PAG.. Hey, I'm not sure where you live but I checked out the store locations online. It shows that there are stores in CA and WA. Hopefully you can visit one of these states soon! I agree the Target prices are a little high -try Walmart. They have the same products although Target may have "prettier" touches. P.S. Thanks for the tip about expired food at the dollar store! @ Erynn.. I'm so surprised you don't have a dollar tree even. =( From what I've read, Daiso has been expanding more and more so hopefully they open more US stores. I prefer Walmart over Target since it's cheaper and I have a few good drawers from there. I hope find a Daiso! And LOL I'm the same with expired food -I'm so paranoid when it comes to that. Random but MILK is one of the worst expired "foods." Blehh.. it's disgusting! @ Elizabeth.. Definitely stop by since you have one near you. I <3 Daiso!! I live next to a Japanese knick-knack store that sounds like a Daiso except their prices aren't as friendly. There are some things for $1-2 but most of their stuff is more expensive than that. They do carry a variety of things though, and I think I might've seen something similar there... not sure how much it costs though. I think this organizer looks larger in the picture -but another option that I've used in the past was storing the brushes in glass jars. I've found nice jars at Walmart and the dollar store -you could fill them with marbles (the type you use for fake floral arrangements) or not have a filler at all. Something else I've used were cute pastel "buckets" the size of a medium jar/cup. I've gotten many of these at Target in their $1 section at the front of the store. You could even use "office" organizers like Erynn mentioned above. Definitely check that store out for the price and if it's too high, check out some of these other options. Hope this helps! 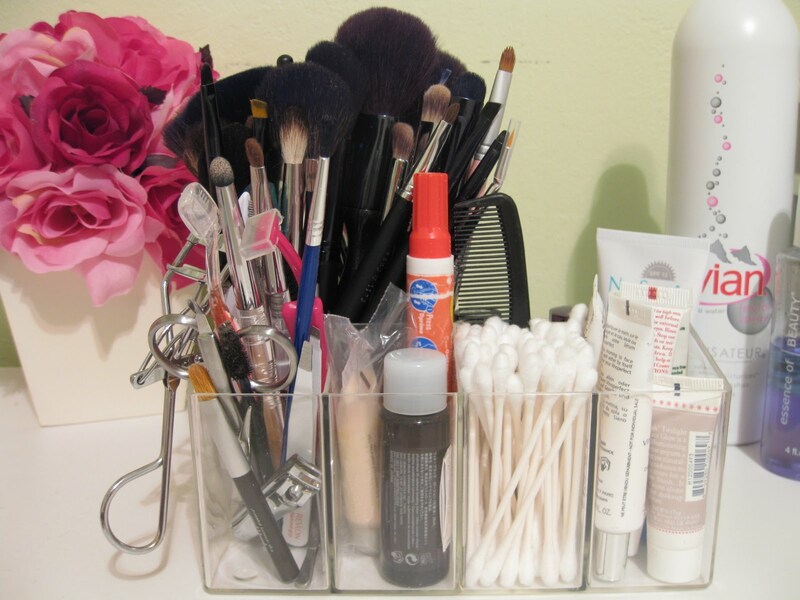 That's awesome, big enough to put all your daily use items and keep it all organized. Nice find! did you have jelly pens??? Oh gosh, I was obsessed with gel pens -I was sooooo into them in elementary school through middle school and still used them in highschool. In elementary school, I carried like 30 of them all in my purple Pochacco box.